Greve de Lecq Barracks, located in Saint Ouen, Channel Islands, designed for the garrison troops stationed in the island at the height of the fear of Napoleonic invasion. 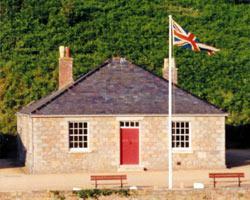 Built almost 200 years ago, these are the only surviving barracks in Jersey. Open on Sundays from May to September. 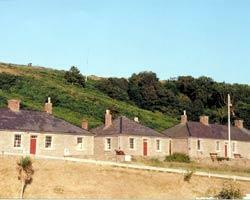 The Greve de Lecq Barracks was purchased by the Trust in 1972. Constructed between 1810 and 1815 to provide accommodation for the soldiers who guarded the Bay from French invasion, the Barracks housed regiments of troops up until 1926. The Barracks is an excellent example of a self-contained military unit and retains many original features, including two prison cells and the ablutions block with outdoor pissoirs ! The Barracks comprises of two blocks for the soldiers, each consisting of two large barrack rooms, with two small rooms for the Non-Commissioned Officers. Between these is a separate block of some five rooms, for the Officers, and this is at present occupied by a National Trust employee. There are also the stable and harness rooms, and at the back an ablutions block, prison cells and various Buildings for all sorts of storage. Ammunition was probably kept some distance away. Grève de Lecq Barracks is located in Grève de Lecq Bay, St. Mary. The parade ground serves as the on-site car-park, and the majority of the site has disabled access provided by wheelchair ramps. Feel free to wander around and discover the site wherever a door is open ! 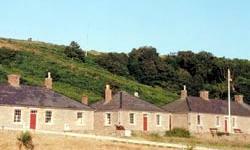 The Barracks are located at the bottom of the eastern slope surrounding the Grève de Lecq Bay, Le mont De La Greve De Lecq, Saint Ouen, Jersey. There are several car-parks nearby. 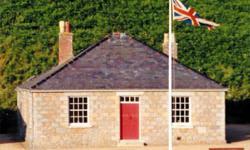 The Barracks are open to the public from May to September. Room 3 (a military dormitory) can also be hired all year round.